Ballets flats are a dream for anyone who wants their outfit to look finished stay comfortable. Living in Southern California, the land of flip flops and sandals year round, ballet flats are a great closed toed show option for our casual and active lifestyles. For mommies, they are a great shoe that is comfortable enough to wear all day and can slip on and off easily while you chase the littles around the sandbox. 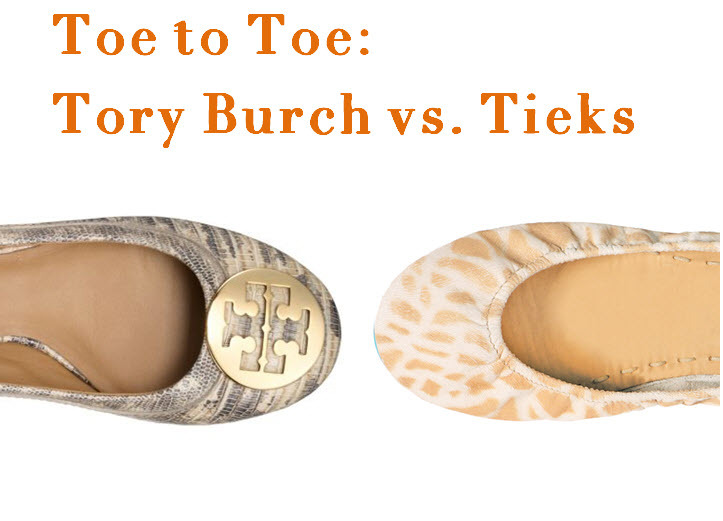 In this post we will be comparing two of my favorite ballet flats, Tieks and the Reva by Tory Burch. Tieks are newer to the fashion scene and most of their customers are probably converted Tory Burch customers who want to try something different but still has a signature look. Their simple ballet flat style is accented with an awesome tiffany blue sole, think Louboutin’s red sole but blue. The two piece sole gives lots of flexibility and allows the shoes to easily be folded in half for easy travel. The two piece sole also lets you reveal the cute teal sole when you take a step. These shoes are unbelievable comfortable and basically feel like socks with a sole on them they are that comfortable. The leather is subtle but it does lend less structure to the shoe, sometimes you can almost see the outline of your toes which no one else probably notices but I feel like it makes them more of a casual option and don’t quite pass for the polished look you get with a Tory Burch flat. The price on these shoes starts at $175. I actually bought most of mine a couple years ago and think they were in the $260(?) range so it’s nice to see their prices now under $200. Yes, it’s a lot of money for a flat, I can’t argue that. But, if it’s a flat you know you will wear all the time, it might be justified. I look at purchases like this in terms of “cost per wear”. I bought these shoes right before I found out I was pregnant with my first child. Throughout my first and then second pregnancy they were a godsend! I wore those shoes day in and day out as my feet grew, shrunk, grew and then shrunk again. Even now they still fit great and don’t show any signs or smell of the heavy wear. I guarantee the cheaper alternative would have never held up as well! LOVE. They come in a cool box and I actually use them to store random kid toys that have a ton of little pieces. They also have a little bag that they shoes fold perfectly into which allows you to easily stash and stow them in a tote bag or luggage. Mommy’s: Dream come true. You’ll look more polished than flip flops and can easily slip on without a notice. Tory Burch’s ballet flat basically put the ballet flat back on the map a decade ago. The line started in 2004 and after being endorsed by Oprah as “the next big thing in fashion” shortly thereafter, the line and the Reva ballet flat lived up to its expectation and became a billion dollar business. The Reva ballet flat was there at the beginning driving the trend with the iconic boho preppy style and signature Tory Burch metal logo on the shoe. These shoes are quality from every angle. From the construction to the materials, no corner was cut in manufacturing these beautiful shoes. With a trend that has lasted 10 years, the shoes themselves have held up 10 years as well. The Reva is the signature style that has been around for 10 years. It’s so classic that I don’t think it will date. I just wore mine today and still got compliments on them. The bling Tory Burch logo on the top of the shoe really makes it stand out as a designer shoe and who doesn’t like a little bling. Where Tieks offers only smooth leather with printed graphics the Tory Burch flats takes it to the next level with perforated leather, embossed leather, suedes. While Tiek’s offers every style at one time, these shoes have seasons like traditional fashion houses. This creates an element of scarcity where if you like a style get it now because it’s not going to be around for more than a couple months. With the Reva being around so long the style is starting to transition out and make way for some other styles like the bar logo flat with pointed toe. These styles are great for someone with a more well developed wardrobe but aren’t quite as suitable for playground play. Basic shoe box but with a cool print. If you like pretty things and packaging you could repurpose it but the cardboard isn’t nearly as withstanding as the Tiek’s box. Finished look: Can’t slip these on with workout wear but are great pretty much anything else, jeans, leggings, dresses. Very versatile and really make your outfit look thought out and finished. Around the office: These aren’t slip on later shoes, they look good enough you could wear them into the office, giving a presentation and out to lunch. Mommy’s: Lunch dates and times when you have to be on and off duty as Mommy. Think, go to a work and then stop by school open house after. Soccer game when you have lunch date after. Looking for Tory Burch flats that are in pristine condition but already broken in. Check out The Real Real. 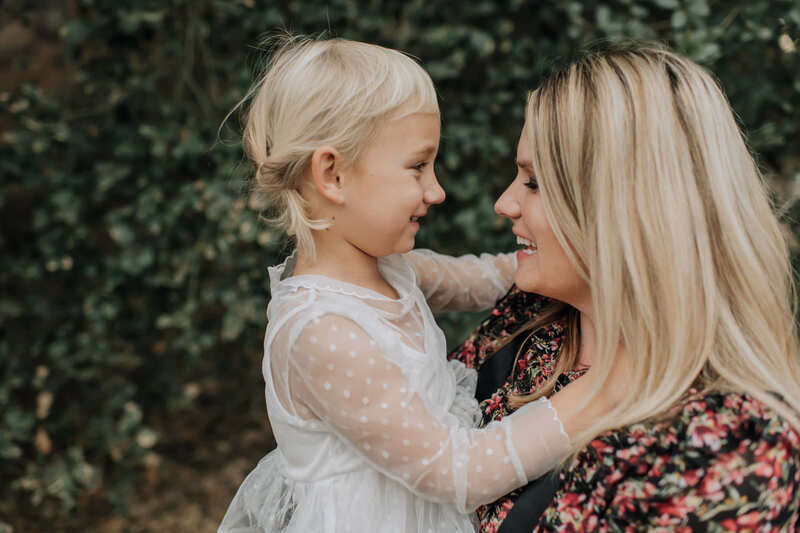 Whether you are a Tiek’s girl or a Tory Burch lover, just remember if you are borrowing from your daycare budget to get a new pair of shoes I would stick with something that you are going to get the most wear from. Do you own Tiek’s and Tory Burch Reva flats? Which is your favorite? I love the way my tory’s look BUT i have heels that are more comfortable, which i find ridiculous for the price. Looking at getting a pair of Tiek’s… so cute, especially in burgundy. Thanks for the comment Alana! I totally agree that some of my Tory Burch flats are the same comfort level as heels. But I do have two pairs that are just as comfortable as my Tieks and I can’t argue that they complete my outfit even better than Tieks. I think the comfort level is style specific for Tory Burch. I have ordered a pair of Tieks and my heel makes this awful embarrassing sound every time I take a step! I even tried another pair of the same shoe and they still do that….has anyone else had this problem? Weird, I haven’t had that problem with any of my pairs. Their customer service is really good so you might want to reach out to them directly and see if they have a solution. It could just be something that happens while they break in. Or you could try one of those ballet slipper socks and see if that makes it go away. I went a size down and the squeeky noises stopped! My new pair required 2 days of breaking in and then they becae pillows of love and quiteness! Sizing down is a good trick! I did it with my latest pair and they were way less squeaky. But all mine pretty much stop squeaking after getting worn in. and as I wore them outdoors I couldn’t return them to the company, then I gave them to my friend Jenna and she never had problems with them, the insoles became dirty an a little bit smelly but not too much to be perceived. In the other hand I discovered the Tory Burch Minnie Travels flats that are the equivalent of this brand to Tieks. These flats are super comfy right out of the box, no need to break in and the soft napa leather molds to my feet like a glove, no sweaty/smelly feet, no blister at all and they have a good range of colors for any taste, currently I own 4 pairs that I really love to wear as my everyday shoes as they look dressy with any outfit, only con they are quite pricey for a pair of flats, I got 2 of mine at a consignation store and one at eBay, the fourth I got it at TB boutique in Vancouver, BC. So I love Tory Burch. I own multiple pairs of Miller sandals and flip flops. Love them! But have tried to love my Tory Burch Reva flats for years. I can only wear them for a couple hours at a time before feeling discomfort. just got My first…of many…pairs of Tieks. Awesome right out of the amazing packaging! They are so comfortable right out of the box! I went and tried on Tory Burch Minnie flats to be sure which I would prefer. The Tieks were: more comfortable, looked richer, and we’re cheaper. SOLD. Ready to order another pair! I don’t own any Tieks but I have multiple Tory shoes like the Reva and Miller sandals and the jelly thong and they are all very comfortable. The jelly thongs are so comfortable! I am a tieks lady! 10 pairs and growing. I went sightseeing in them and my feet didn’t hurt after 6 hrs. that says a lot! Thanks for the comment. Totally agree, they are comfortable for so long. I particularly like them for long flights or days I know I need to do alot of walking. Although this is an old post it’s the time of year people are switching from boots to flats. I bought my friend a pair of Tieks and of course I tried them on. I wish they came in half sizes cuz they felt just a bit loose on me but he really loves them. I’m a huge Tory Burch Reva fan but a few years ago Tory introduced the TB Minnie travel flats which are often compare to Tieks and look identical to the Revas. They work perfect for me. The best thing about both Tieks and Tory’s is the come in larger size (up to size 13) so no women or man like me miss getting themselves a pair. Do Tory B. come in 1/2 sizes and are they true to size? My first Tieks were about a 1/2 size off and I still wish I had 1/2 size smaller. A full size smaller was too tight. I still love the look and they are quite comfortable. I bought Tieks a year ago and tried, tried, tried to love them. I had swooned over the website for upwards of a year and they were my first purchase with my end-of-year bonus. Originally I chose the Obsidian Black but found they were very tight on my foot. I read online that the embossed shoes take longer to break in than the Tieks Classic line, but I wasn’t willing to spend a month breaking in $195 shoes only to find they never fit correctly. I exchanged them for a pair of the Matte Black Tieks. They were adorable and slightly more comfortable out of the box. I decided to commit and wear them outside. Unfortunately after about five hours, the top of my foot was in real pain, and my pinky toe was bright red. When I sat down I’d often slide them off and see the imprints the shoe left on my foot. Hmm, not the insta-comfort I was looking for. After a few months I sold them online–they hold their value well. Recently I bought my first pair of Rothy’s in black and I like them much better. My pinky toe is less constricted and I’ve never had a blister with the Rothy’s. They are machine washable, which is great. And bonus: they only cost $125 for the rounded toe variety. I’ve continued to swoon over Tory Burch shoes, though, and just yesterday bought a lightly used pair on Poshmark (you can find some solid deals if you don’t like paying $225 for shoes and you’re willing to comb through listings). They will hopefully be here in a week and I’ll have more to say on TB! Hi Laura! I keep seeing ads for Rothy’s and have been wondering how comfortable they are. I have Tory’s that are very comfortable and some less so. I hope you picked up a comfortable pair! Alas, although I bought 10s they are markedly too big for me. If I put on a pair of thick socks I can wear them. Not quite the look I was going for with my new TB flats! Do you know if that’s normal/typical for TB? I have never tried on 10s that were way too big for me before. I have owned multiple pairs Tory Burch flats and have ended up selling all but one pair because each destroyed my feet in their own unique way. I have messed around with different sizes and styles, but had no success. I would get blisters on every place of my foot imaginable and I have found that none offered any cushion what-so-ever. Finally, I have grown away from the large TB symbol that is often placed on top of the toe. I like the simplicity of Tieks (branding is apparent from the Tiffany blue bottoms, which I find very cool). I own three pairs of Tieks (matte black, chestnut, and cobalt) and find them extremely comfortable and trendy. For me they are worth the money. I have tried Tory Burch flats in the store, but could never bring myself to purchase a pair. I wore Born Julianne flats, which I thought were extremely comfortable. Then I discovered Tieks. At first I was a little unsure, but since then have just ordered my third pair. Thanks for the great blog. I am considering buying a pair of Tieks but find it gross that any pair could have been potentially worn by someone trying to break them in unsuccesfully for who knows how long -as long as it was “in the house”. For that price i would like a NEW pair of shoes-and i highly doubt the company DISCARDS all these worn (not just tried on-WORN for a week or two, in the house) and returned shoes.